How does Google's second phablet compare to its first? The Nexus 6 was a departure for Google's Nexus range, moving to a phablet screen size and a flagship price. But it still impressed, thanks to top tier specs and features, plus stock Android on board. Now, alongside the Nexus 5X, Google has unveiled the Nexus 6P as the successor to the Nexus 6. Lots has changed, including the manufacturer, with Huawei taking the helm instead of Motorola this time. So, how does the new Nexus stack up to the old one? Past Nexus phones have employed fairly conservative designs, but it's all change with the Nexus 6P and its all-metal body. Here's how big of a deal that camera bulge is. Check that profile! The Nexus 6P, which will be available in silver (Aluminum), black (Graphite) and white (Frost), is the most premium looking Nexus handset yet, thanks to that metal shell. Plus, it's slim at just 7.3mm thick. The protruding bar at the top helps it stand out, though not necessarily in a good way, as it breaks up the otherwise sleek design of the phone. Still, it's certainly a more premium prospect than the Nexus 6, which is a chunky 10.1mm thick and has a hard plastic case. It does at least have a metal frame though, which goes some way to hint at the high-end innards. And here's the Nexus 6 profile. See the difference? At 5.7 inches, the Nexus 6P actually has a smaller screen than the 5.96-inch Nexus 6, but both are undoubtedly in phablet territory. They're both packing 1,440 x 2,560 (QHD) AMOLED screens, making them nice and sharp. The Nexus 6P comes in at around 515 pixels per inch (ppi) and the Nexus 6 achieving 493 ppi. In theory, there's not a huge amount to choose between the screens, it just depends how substantial of a phablet you want. The Nexus 6 was a powerful phone when it came out, and it still stands up fairly well now, thanks to a 2.7GHz, quad-core Snapdragon 805 processor and 3GB of RAM. But the Nexus 6P has it beat with an octa-core Snapdragon 810 processor, though it too has 3GB of RAM. Those specs put it on par with many of this year's flagships, like the Sony Xperia Z5 or HTC One M9, while the Nexus 6 is more comparable to last year's phones, as you'd expect. One other area where you can expect more from the Nexus 6P is storage. While the Nexus 6 comes in 32GB or 64GB sizes, the Nexus 6P is launching in 32GB, 64GB and 128GB varieties. This is especially handy, as there's no microSD card slot in either phone. The 12.3-megapixel (MP) Nexus 6P camera actually has nearly one less megapixel than the 13MP Nexus 6 one. But, as we all know, megapixels aren't everything. Because, while the Nexus 6 has a solid snapper, it rarely excels and especially struggles in low-light. Google promises the Nexus 6P will handle far better with its 1.4-micron pixels within the sensor. These super-sized pixels are designed to capture more light, hence stronger low-light and indoor photography. You can also look forward to improvements from the front-facing camera, as this one has had a megapixel boost, up to an impressive 8MP from just 2MP on the Nexus 6. The Nexus 6P is heading out the gates with Android Marshmallow on board, making it among the first phones to run the latest version of Google's mobile operating system (OS). The Nexus 6 is one version behind on Android Lollipop, but it's due an update shortly – a week from now, as of this writing. 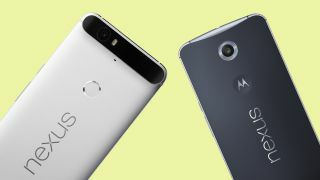 And both phones run stock Android, which both keeps the slick, intuitive design of the OS intact and ensures speedy updates to new versions. It's worth noting, though, that the Nexus 6P will likely be supported with updates for around a year longer than the Nexus 6, given that it's a year newer. A fingerprint scanner almost seems like a requirement for a flagship phone at this point, so it's not surprising that the Nexus 6P has one, especially as Google is rolling out Android Pay. The scanner, known as the Nexus Imprint, is in a different position to most, though, as it's sat on the back of the handset, while the typical placement is on the front below the screen, as seen on the iPhone 6S and Samsung Galaxy S6. The original Nexus 6 misses out on a fingerprint scanner, so that's one big feature you won't get if you stick with last year's model. The Nexus 6 has reasonable battery life, with the phone's 3,220mAh juice pack typically lasting between a day and a day and a half with moderate mixed use. But there's always room for improvement. There's a good chance we'll see that improvement from the Nexus 6P. Despite having a smaller screen, it's got a larger 3,450mAh battery, so hopefully this will be a long-lasting smartphone. Both handsets benefit from speedy QuickCharge 2.0 when it comes time to plug them in, but the Nexus 6P has an extra bonus in the form of the new, reversible USB-C port. That makes actually plugging it in less of a hassle. The Nexus 6 also has the advantage of being available now, while you can't get hold of a Nexus 6P until later this October through pre-order. Google's yet to announce an official release date. With a completely new and very high-end design, a likely better camera, a bigger battery, more power and the addition of a fingerprint scanner, the Nexus 6P looks to be a marked improvement over the Nexus 6. But it's also more expensive and has a smaller screen, so the Nexus 6 still has its selling points. If you're on a budget or want a truly mammoth device, the Nexus 6 is still a strong buy. Regardless, the Nexus 6P could well be one of the best phablets of 2015 and the best Nexus device ever, though we won't know for sure until we've put it through our full review. A new Chromecast is inbound too.